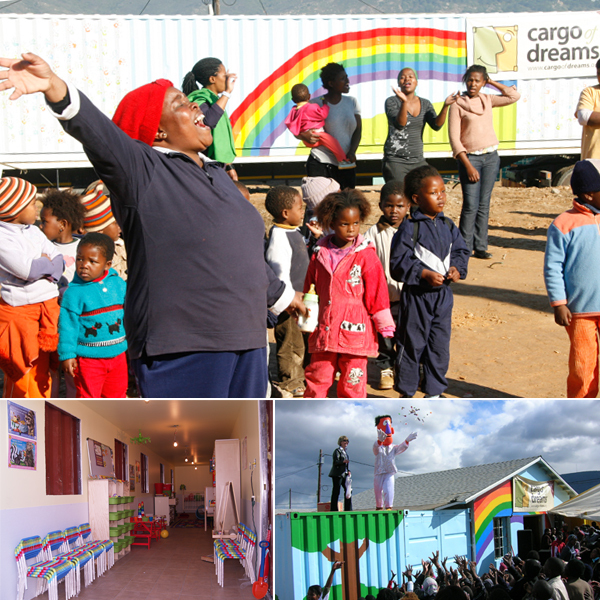 A friend recently told me about Cargo of Dreams, a wonderful non-profit organization that converts old shipping containers into fully functional operating facilities for impoverished communities in Malawi, Paarl, Nepal, Mexico, among many others. So far, 20 have gone out and more are still in the process of being remodeled. The woman behind the look and function of these containers is Nicole Michelen. Born and raised in Guatemala, she studied interior design in San Diego before moving to Los Angeles. After four years, she has achieved outstanding results as Cargo of Dreams' Interior Design Coordinator. She was kind enough to share a couple of her renderings and explain her work. Q: Why did you choose to work with Cargo of Dreams? A: I love their goals and I felt their mission provided a better opportunity for me to help others and do what I like to do the most, which is to design. Q: How does a town receive a cargo container? A: We partner with recipient communities with whom we have a standing relationship, or with an existing partner such as Compassion International. 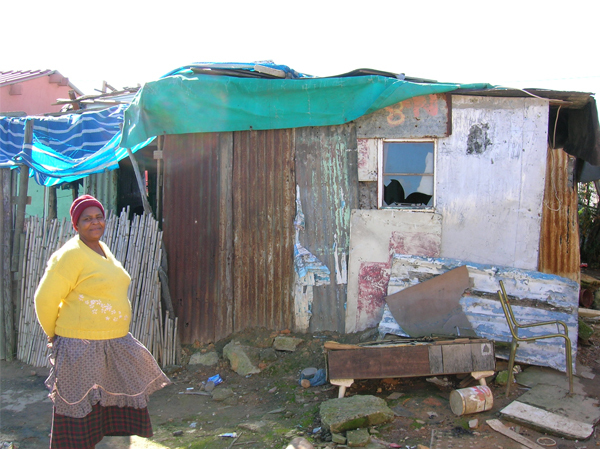 We don't have an application process where someone can apply to receive a container. 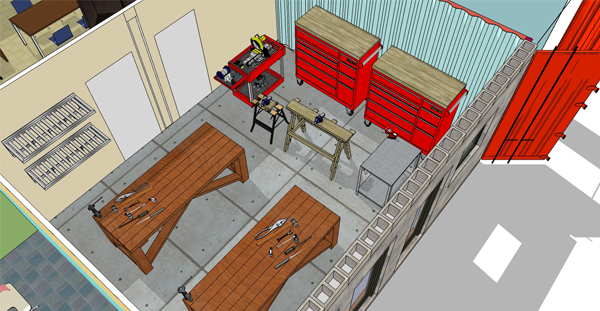 If a potential recipient community has a relationship with a group, church or company that they believe might be willing to sponsor the remodeling of a container, we talk to both groups. Bottom line, we want to make sure there is credibility, a long term plan, and some sort of track record before we move forward. 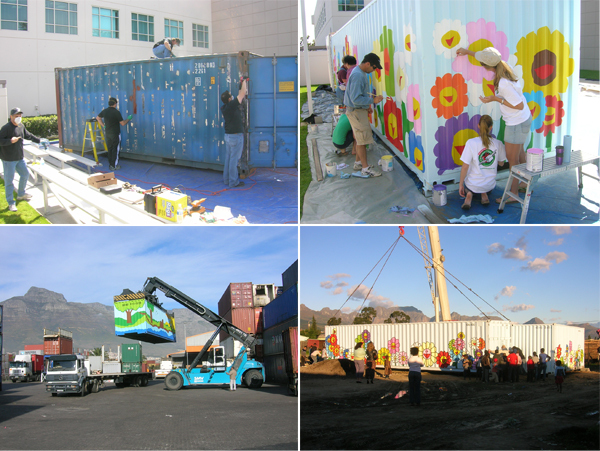 Q: What are the remodeled containers used for? 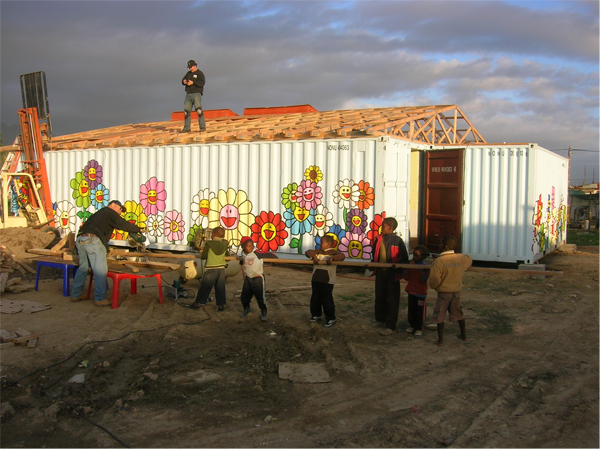 A: The containers are used for schools, baby gym/stimulation rooms, vocational rooms, offices, medical clinics, and computer rooms. Each container has a restroom and a small kitchen area. Q: How do you make a container comfortable or usable for people? A: You definitely have to play around with the space and furniture. Most of our containers are 40' x 8' by 8.5". Sometimes it is a good idea to use freestanding partition walls to divide spaces and create privacy where needed. Also, I like to stay away from bulky and big furniture to be able to fit more. But other than that, it's like a furniture puzzle within corrugated walls. A: After determining what activities will be performed in the spaces and how many containers the building will be made out of, I go into deep project planning and research. I choose the furniture and equipment needed to propose a space plan that is safe enough for people to get around. Most of the time, people are used to very crammed areas and will always want to fit as many people as possible, so we don't worry about U.S. circulation codes. We just make it as functional as possible. That's one of my main goals. 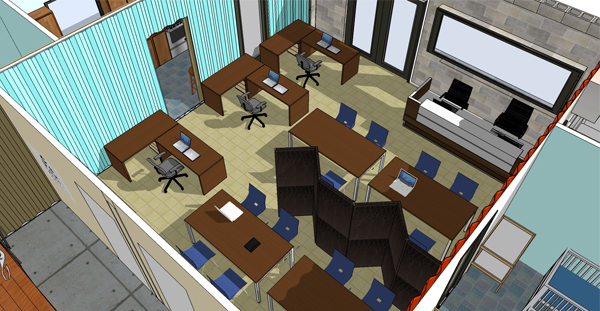 After the design is planned and ready, I select materials and create colorful 3D renderings that look nice and inviting. Q: What happens once a container is available? A: Individuals of all ages and social groups help out. Three-year-olds have worked alongside their grandparents, homeless people have given to those less fortunate, and even incarcerated women have participated. Some people have helped sew and paint, while others have made musical instruments and puppets. People who are not usually able to use their talents for international missions can work together to build a new facility for those in need thousands of miles away. 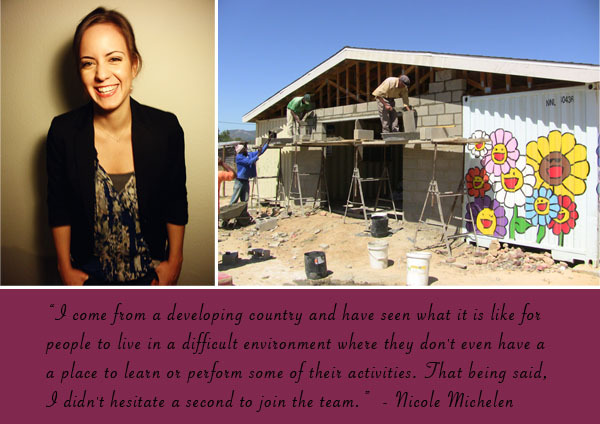 Q: How does it feel when you see the completed renovation and know that it will be useful to so many? A: I feel a complete sense of joy that is so strong. While, for me, it will be a memory that will last a lifetime, it will remain present in other people's lives. It is a hard feeling to describe, but in the end, I am thankful to have been a part of it and cannot ask for more. Nicole is a talented interior designer. She works hard to help so many people so that automatically makes her one of my favorite people. 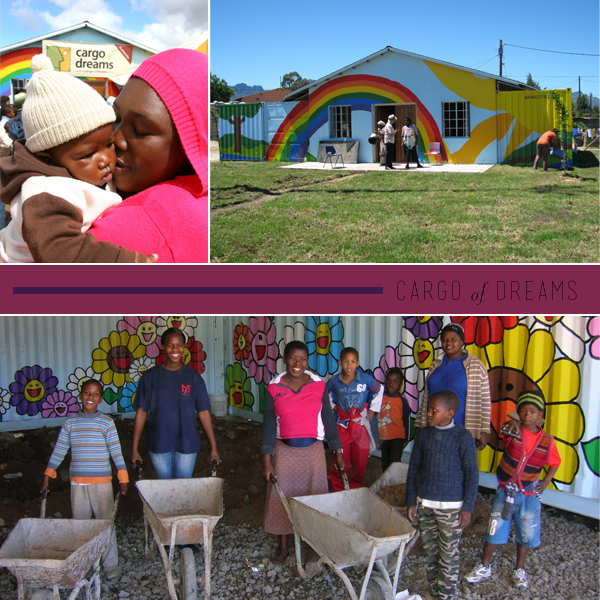 If you want to know more about Cargo of Dreams, check out their site.